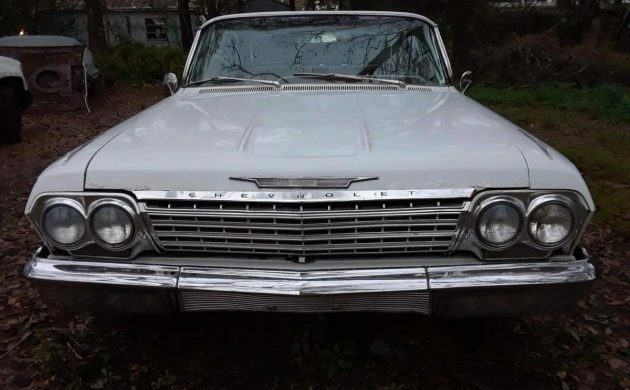 This 1962 Impala SS needs complete restoration, but the good thing about it is that the car runs and drives, so it could still be used while the restoration work is undertaken. 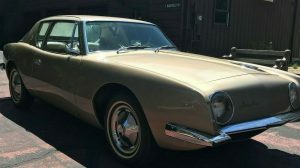 If you are a person with a family and are looking for a classic that you can enjoy with the whole family, this might be a car worth considering, as they have plenty of rear legroom to accommodate even the tallest teenager. 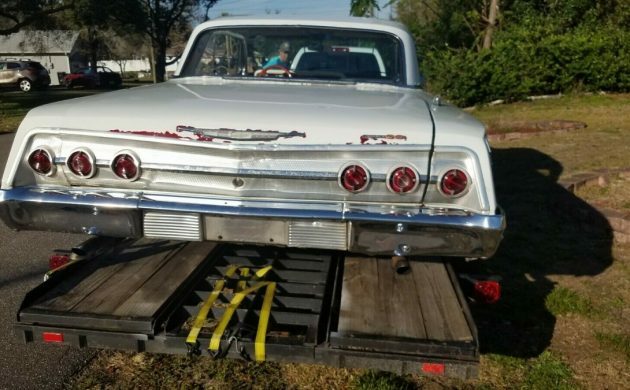 The Impala is located in Spring Hill, Florida, and is listed for sale here on eBay. 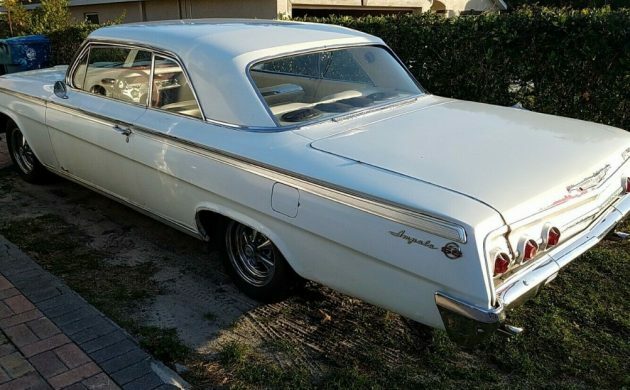 The Impala is a great looking car, and while the owner says that it has rust to address, he isn’t very forthcoming about where it is, or how extensive. I can see some minor rust in the bottom corner of the driver’s door, and also a few bubbles in the lower quarter on the same side, but that’s as much as can be established with the photos and description provided by the seller. The paint is peeling in a few places around the car, but it does appear that the car could be used as it is. The interior is not original, but it is certainly serviceable. The upholstery looks quite solid, but there are a lot of minor details that would need to be tidied up to really make the interior shine. The carpet is faded in a number of spots, and I’m not sure how it would respond to a dye job. There are a few rough edges around the upholstery piping, while there is also a real collection of aftermarket speakers fitted to the rear parcel tray. The car is also fitted with power windows, but the master control is hanging loosely from the driver’s door. 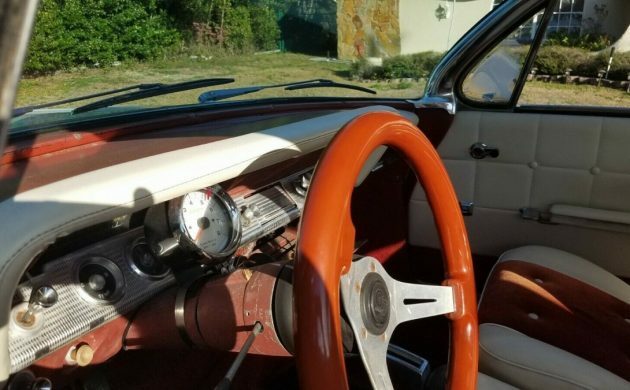 The interior could certainly be returned to original, but whether you wanted to do this would depend on what you would want to do under the hood of the Impala. Under the hood, we don’t find the original engine, but a 350ci V8. This is backed by an automatic transmission, but I’m not sure what type. This was the reason that I raised the question about whether to change the interior. 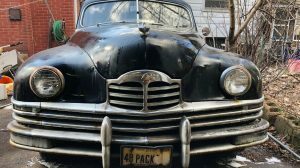 This is never going to be a numbers-matching car, so it would be a question of whether to source a date correct engine and transmission to restore the car to original specifications, or whether you would leave it pretty much as it is mechanically, and maybe just tidy up under the hood. The owner says that the car runs and drives okay and while it may not be original, that 350 should give the car reasonable performance. 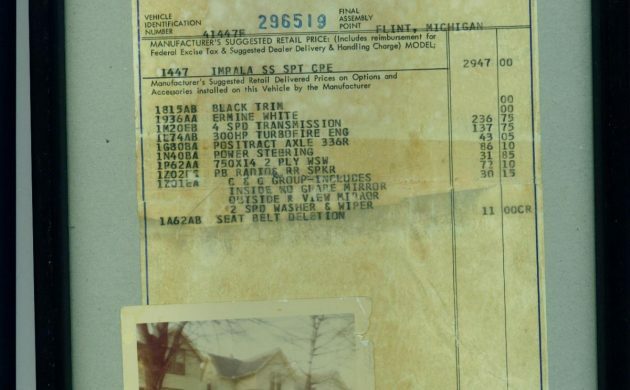 The owner says in his ad that when restored, that as a true SS, this Impala would be worth between $50,000 and $70,000. If this were a numbers-matching car, then that claim could be pretty close to true, depending on the original engine. However, even though this is an SS, its true worth is hard to gauge, as it has undergone modifications, both mechanically, and to the interior trim. At the time of writing, bidding has reached $7,900, but the reserve hasn’t been met. 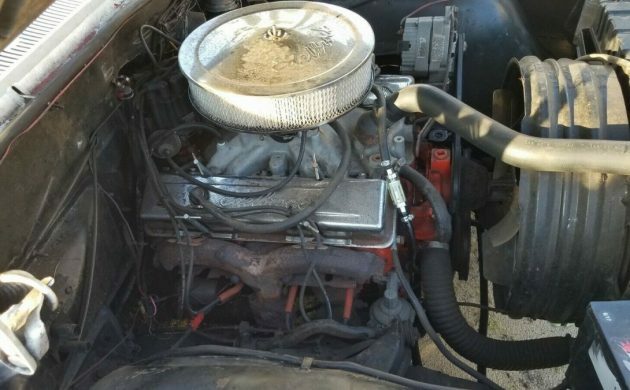 There is also a BIN option of $8,900, and 11 people have bid so far, it will be interesting to see if it reaches its reserve, or if someone wants the Impala badly enough to just hit the Buy It Now button. Definitely my favorite year for these. the first question I have who give a dam about this numbers matching crap so you are 40 mile from nowhere and you car quits! whats numbers going to do for you ! if I bought this car it would get a rebuilt 327 with a close ratio muncie 4 gear and 355 gears in the rear end a red interior and throw that ugly steering wheel in the dumpster now you have the makings of a real ss! and there is no chev in the world worth 50 to 70 grand wake up and smell the roses! maybe low production vetts! but they built 100s of thousands of chev impalas! Wrong!! They only built a small amount of SS Impalas! Seems like a deceent 62 that you could bring up to whatever level you wanted. Like the guys said work on it and cruise! Good luck to the new owner. I’d leave the 350 and install 4 or 5 speed.!! Is that the original fan shroud? Looks like a sump pump well. 10,000 tops. I would put a mini mouse in it since it’s not all original. I want to poke out my eyes after seeing that interior. What a shame. This ‘Pala obviously had a respray/bondo job somewhere down the line.Cred to seller for including a pic of the cowl tag.Paint code 923=Roman Red, trim 875=red vinyl interior. Lots of little things to be done or missing,however the car doesn’t seem really bad,neither does the price if one can tackle most work without paying pros. a great daily driver. That’s my .02 though. Great first time entrance into vintage car world. But bit of a Frankenstein. The price seems fair but rust is undeterminable at this point. Would need a lot more pictures and or personal inspection. Florida cars are subject to rust. Since it has a 350 engine likely more reliable. But the question begs was the car abused or neglected and engine gave way because of it. Which means that thought process could apply to entire vehicle. Which means more money out of new owners pocket fixing a sizable list of items. So $8,900 is top dollar, for most. Anyone paying more in bidding war should probably let it go. But could be driven by childhood memory etc. I’m with the group in the $7,900 neighborhood. But hope someone shows up with it at a cars and coffee and has fun with it. 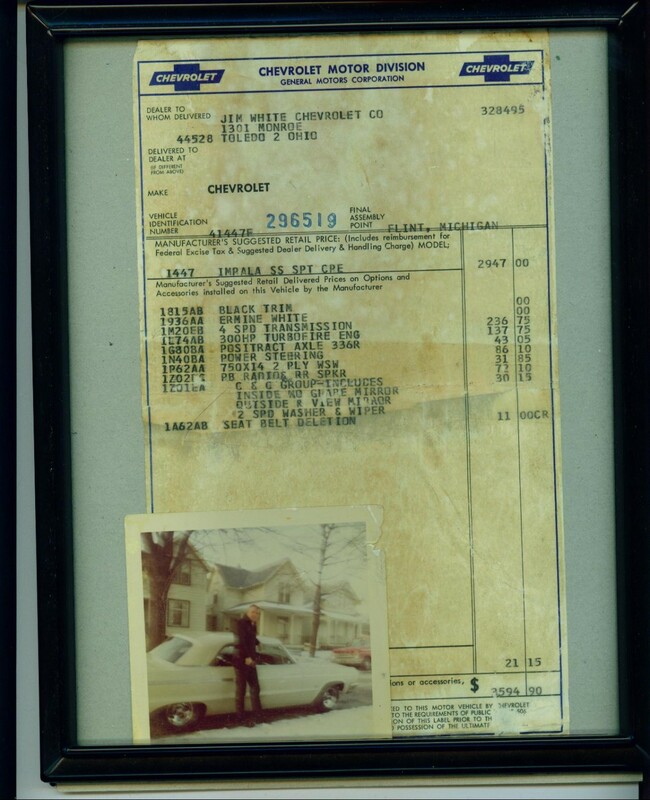 This is when GM built a car that even us ford guys looked at. The interior is hideous, that steering wheel stinks. Total restoration project to me. I hope whomever buys this one returns it back to what it was. It would be a awesome car then. One of the best deals I was never able to realize was on a pair of ’62 Impalas, one an SS. This was back in 1998 and I was in college at Montana State University. 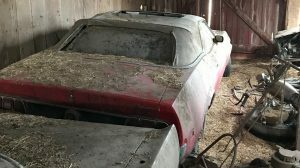 My brother and I were poking around farms outside of Bozeman, and came across a place that had a 62 Impala SS and and a 62 Impala 2 door sitting next to a barn. 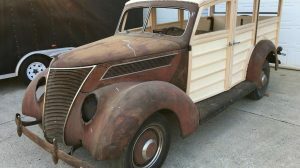 Stopped and talked to the farmer who owned the place, yes the SS ran and drove but needed restoration (I recall it being white with red interior), the bronze 2 door was a parts/donor car. “$1,000 for the SS, $1,500 for the pair”. Being a broke college kid I couldn’t raise the funds at that time….drove back by a year or so later and of course both cars were gone. my mother bought a new 1962 SS 327-250 horse impala beautiful car cream color outside black int inside with chicken bar on dash above glovebox. I loved the car I bought a new 1964 SS 327-300 horse 4-speed. all white with Black int. over the years I had 3 of them . loved the 1964 great ride and fast for a big car.